Not sure "vintage lovers" was the right phrase there, but you know what I mean right? Lol. Here's a vintage card I whipped up on the weekend using one of my fave sets from the new Stampin' Up!catalogue, Established Elegance. Can I begin to tell you how excited I was when there were TWO new ribbons with Always Artichoke in this years catalogue? This is one of my fave colours and it's easy to use for traditional cards and also to freshen up a little like I have here by using Pretty in Pink and Very Vanilla. The seam binding is great for doing double bows and also scrunching up which you will see in all it's gorgeousness on the blogs in months to come. A couple of other new but already firmly entrenched favourites I have used here are the First Edition DSP and the Designer Frames Textured Embossing Folders Set (you get this embossed frame and an oval one too). I hope you like today's sample. I hope to get back in here by the end of the week, but then things will likely be quiet for a few weeks while I have a little blogging break to spend time with the boys on the school holidays. We will be spending time just hanging out at the beach house and doing the usual round of playdates and movies and park expeditions. I really love the school holidays and the chance to really relax and chill with the boys. I printed out 200+ photos on the weekend and have lots of new goodies to play with so I suspect there will be some crafting in there somewhere, so I will have lots to blog when the boys are back at school for term 4 (?? where did this year go?). Hello lovely ones. What a fabulous Friday don't you think? I've had such a lovely day today. It's been sunny and warm and I've had a relaxing day and I'm ready for a nice weekend ahead catching up with friends and spending time with the family. As I mentioned in my last post I have been getting stuck into my scrapbooking lately. Here's a new paper page I did this week. I loved this photo of Josh and our 'puppy' Oscar who was only 8 months old when this photo was taken! Josh loves him to bits. I've used the new Mocha Morning DSP on this layout, it works fantastic with Crumb Cake (kraft cardstock) and has 12 12x12 papers in Very Vanilla, Soft Suede, Crumb Cake and Early Espresso. It also has some metallic and flocked papers. I have also used First Edition DSP which is the fantastic small print paper. This is great to stamp on too. Lots of punches used too and also Creative Elements stamp set and Soft Suede and Early Espresso ink. Hello lovelies. 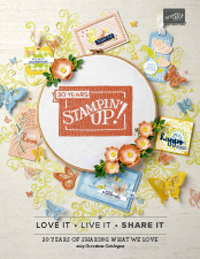 Time to introduce the last new Stampin' Up! 2011/2013 In-Colour, Calypso Coral. I have to confess I found this colour the hardest to create with, not because it's not a gorgeous colour, but more because it's not a colour I usually create with. Here's what I came up with. This uses Calypso Coral, Pool Party, Early Espresso and Very I have used the gorgeous First Edition DSP again (you will be seeing me use this a lot this year - I love it!) and Creative Elements stamp set again. I do have other stamp sets that I promise I will start using soon, but I just love this set! One of the things I love about the First Edition DSP is that there is a lot of white space, so it's great to stamp directly onto. In the above picture you can see I have stamped directly onto the background layer, and also some of the flower layers. The butterflies are also stamped directly onto the DSP. Just love that look. The flower in Creative Elements is fabulous for fussy cutting and layering and I have used one of the new 2011/13 InColour DSP polka dot brads for the flower centre. The polka dot is quite subtle and I can see myself using these LOTS! I am pleased to say I had some responses to my calls for places to donate some used products to and I had a big sort out during the week and came up with this. On Friday I packaged up and posted four boxes of goodies to donate to thevarious causes including disability organisations, children's craft group and some elderly CWA groups of crafters. This made me feel so great to know that these people would enjoy using my surplus craft stock. I find myself much more creative when I have less stamps I have decided! I've also been doing some scrapbooking tasks. I sorted out a pile of unfiled layouts and worked out what new albums I needed to buy, and what layouts I wanted to work on over the coming months. Even the process of doing this made me remember why I love scrapbooking so much. There were so many great memories in those pages and I felt such an emotional connection to them. Last night we all sat down and looked through some of the albums which was lots of fun for the boys. Here are my layouts on the bench before I filed them. In addition to paper layouts, I've been doing some digital layouts this year too. I did this one yesterday for my One Little Word album, where I am focusing on the word Nourish. I decided a while back that following the exact month by month class wasn't working for me, so instead I have been exploring my word, and documenting ways I am working towards putting it into practice more this year. Sort of like a goals journal and with layouts about bits and pieces I have been doing along that theme of my word "Nourish". Works for me! 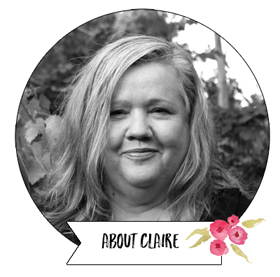 This layout was about the fabulous 'me time' day I had at the Melbourne International Flower and Garden Show this year (you can click on the image for a closer look). This digi layout uses a template by Cathy Zieleske and papers by Katie Pertiet. This card is actually a simpler version of the Pool Party one I posted last week using Stampin' Up! Creative Elements. One of my fellow demos on our cool online demo community here in Australia said she wondered what it would look like in Wisteria Wonder, so I made it as one of my alternate make and takes at a workshop on Saturday. I think the Wisteria Wonder, Soft Suede and Very Vanilla look wonderful together. I love the effect of the sponged Soft Suede around the edge of the butterfly. Hello :) Happy Fathers Day to all the wonderful fathers out there. My husband Paul was woken by the boys excited to give him their gifts they had made and got from the fathers day stall, He is a great Dad to my boys, and we all love him lots. He is off at swimming with the boys (and hopefully getting his free doughnuts Kings Swimming give fathers on Fathers Day! ), so I am ducking in to post. 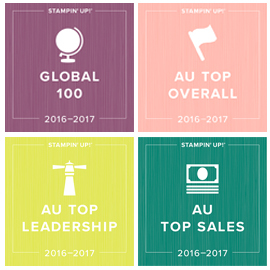 I wanted to share some more colour combinations using the new Stampin' Up! 2011/2013 InColours. I just can't get enough of these fabulous colours - love them all! Yesterday I got to share them with one of my favourite group of customers, and this was one of the make and takes we did, featuring Island Indigo and Lucky Limeade with a touch of Pool Party and silver. I thought this made a nice colour combination for a bright Christmas card - what do you think? 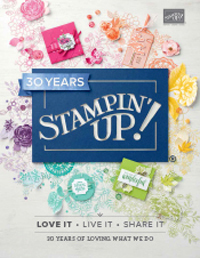 The stamp set I have used is Merry and Type, one of the new Christmas sets from the just released 2011/2012 Stampin' Up! Catalogue. Here's another card using the same colour combination, but this time adding in a little more Pool Party and using the single Stampin' Up! stamp Something For Christmas instead. This is a great stamp for using your new InColour markers with as well. I hope you like today's cards!